The bold architectural design – individual bridges leading to exceptional infinity pool sanctuaries and rugged stoned-faced columns reaching towards the sky – makes Jade Mountain one of the Caribbean’s most mesmerizing resort experiences. private infinity pool glide into one another to form extraordinary platforms floating out into nature. With the fourth wall entirely absent, Jade Mountain’s sanctuaries are stage-like settings from which to embrace the full glory of St Lucia’s Pitons World Heritage Site, and of course, the eternal Caribbean Sea. 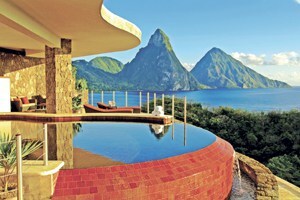 sanctuaries or at Kai en Ciel, Jade Mountain’s boutique spa and fitness studio. The resort major domos and a dedicated resort team ensure outstanding service around the clock. restaurants, bars, boutiques, art gallery, spa, scuba, bike and watersports facilities as well as 2 soft sand beaches available to Jade Mountain guests at all times. JADE MOUNTAIN: US reservation office: (Mon- Fri). Sicily - An Offer You Can't Refuse!